Tonight was a magical night. At 9:09pm on 9.9.09 my wife and I were at Red Rocks, watching roadies try to fix a part of the stage. 10 minutes later The Killers had blasted into their first song Human. 20 minutes later, a rust colored 3/4 moon rose above the horizon to the east. All of this; the music, the volume(! ), the venue, the visual of the light show beneath you with Denver off in the distance and the temperature made for a amazing experience. Tonight was a magical night. Red Rocks is easily one of the top three venues in the world to see a concert. Many people are familiar with the scenes of Bono from 1983 running around stage singing Sunday Bloody Sunday. I would call myself a passive fan of The Killers. We actually went because my wife had never seen a concert at Red Rocks and this was a band that we both like. The Killers are classified as rock but they are a strange combination of many genres. I hear pieces of The Cure, Joy Division, Electronica and straight forward Rock. It’s better to say, I hear influences; not straight up rip-offs. They are the mash-up. 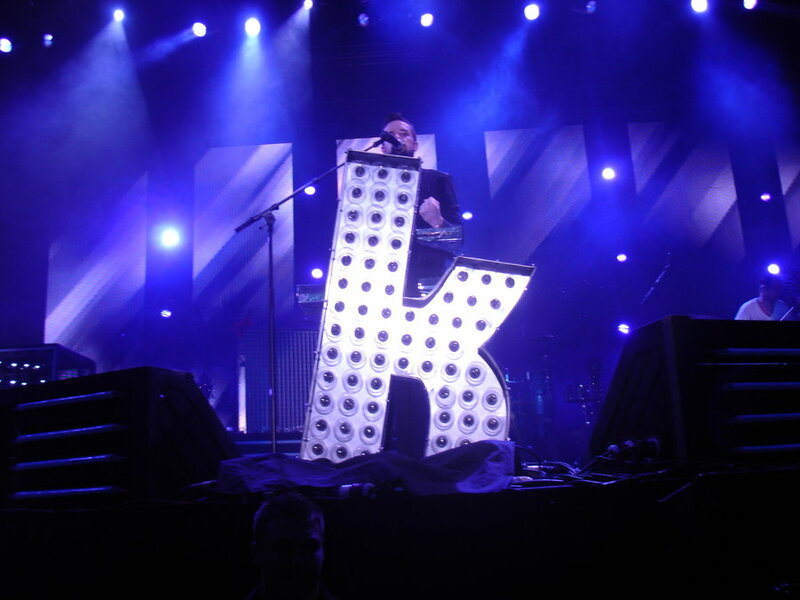 The Killers in a way is the embodiment of their home town of Las Vegas; eclectic put cohesive. (Plastic is another word that comes to mind when talking about Las Vegas. Did not get that feeling from the band.) The band itself is an eclectic mix of bipeds; each member looking like they came from another type of genre/group. From the outside, this diversity may appear as an anti- image. Once you hear the music you understand that it’s more than that. With fans, I saw everything from fists pounding in the air, to dancing, to jumping straight up and down (electronica style or that tribe in Africa). The concert was amazing. This is the first concert I’ve been to where I didn’t know the majority of the what would be played and took on somewhat of an observer role. I had many ideas about how I would market this event. More about that in a minute. The diversity that I saw in the band, the show, the crowd makes me want to create more diversity in the things that I do. It makes me want to recommend to all business people/businesses that they create different things. Don’t lose site of your core but if your company creates products, start a service endeavour. If you are an ad agency, look at social media from a marketing perspective. If you’re a stodgy brand, start a Twitter account and be transparent. This is easier than you think. Ask your employees what they would like to do as pet projects. I know. I know. What was in the air at the concert? It’s now 2:30am and I’ve got to get some sleep. I’ll post about how to extend the concert experience tomorrow. We will see if I can sleep with my ears ringing. God I love that sound. What to do when you’ve been hacked.